The oldest masks to-date went on display in Jerusalem this week, one of the largest exhibits to ever display artifacts believed to have been created thousands of years before the Bible was officially established. Now the oldest artifacts known to man will be available for spectacle to the public in Jerusalem. Eleven stone masks allegedly date back nearly 9,000 years, and present historians with a glimpse of early civilization rituals. James Snyder, director of the Israel Museum, said it is very exciting to look at objects that are ancient. This is part of a theological connection between Christianity, Judaism, and Islam. It is a thrilling experience, he added. These masks are thought to purposefully resemble skulls, characterizing their own unique personality. Some have cartoon style designs, while others give rise to the image of teeth. One of the masks is even described to resemble Hannibal Lecter. It was previously believed that these masks were tied to ritual sites, but now studies conducted at Hebrew University in Jerusalem have many researchers believing that these masks were actually worn. If the studies are accurate, these masks date back to the Neolithic period, as some claim to be the caveman times. There is no evidence of writing during this time, so the mask ritual allegedly predates this intellectual advancement. Perhaps the mask means more than a ritualistic behavior, but the public in Jerusalem will continue lining up for a look at the oldest artifacts available, forming their own hypotheses around their existence. Cave drawings depict people wearing animal masks, reports curator Debby Hershman. Most of the masks where thought to be out of reach for excavators because it is believed they are made of biodegradable materials, making these eleven findings truly valuable. 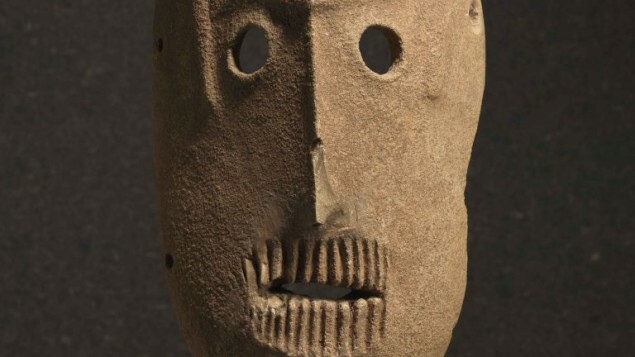 The stone-made masks were created at a turning point in history for human civilization, when early tribes were believed to have transformed from hunter-gatherers and began cultivation. Jerusalem is believed to be the center of the agricultural revolution. Hershman believes this to be the most important revolution to ever occur in history. The Fertile Crescent, where the masks were found, refers to an area of fertile grounds, including rivers that stretched from the Nile to Euphrates and Tigris. It was considered to exist in areas of Israel, Jordan, Syria, Lebanon, and Iraq, as the Mediterranean Sea lies just outside this region, and the Arabian Desert is just south of the geographical arc. To the east, the crescent extends to the Persian Gulf. An Orientalist by the name of James Henry Breasted is considered one of the first to introduce the term “fertile crescent,” but it is also known as Mesopotamia. He claims this to be the earliest home of men in the area of western Asia. The masks took 10 years of carbon-14 dating to determine their authenticity, but what makes them really remarkable was their location– a 20 mile radius near Jerusalem, where the Judean hills meet the Judean desert. The Face-to-Face exhibition, as it is called, is open to the public at the Israel Museum in Jerusalem from March ’til September, making available to the public the oldest artifacts known by man. One Response to "Jerusalem: The Oldest Artifacts Available to the Public"
Congratulations! Perhaps there was no need for the spoken or written word because communication was perfectly accomplished without it. Thank you for taking us to one of the seats of civilazation. See you then, next year, in Jerusalem.